Climate Change is Determined by Science, Not Politics! 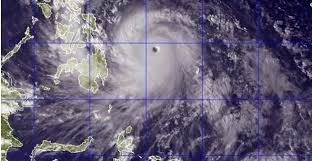 The Philippines has experienced possibly the worst typhoon that has ever been recorded. Extreme winds battered the country and left damage that resembled the effects of a major tsunami. It has been estimated that around 10,000 people may have been killed. Guiuan, a city with a population of 40,000 was largely destroyed; Tacloban, a city of 220,000 people was flattened; many towns in the Cebu province suffered 80-90% damage and Baco, with a population of 35,000, was 80% under water. The devastation that the Philippine people suffered makes the Christchurch earthquake a minor incident in comparison. The highest category for a storm is five and each catagory has winds of around 30 km faster than the one before. Hurricane Katrina (one of the deadliest hurricanes to hit the US) was a category five storm, with winds of up to 265 km an hour, Typhoon Haiyan brought winds of over 320 kilometers an hour, enough to easily make a sixth category. Yeb Sano, the Philippines' lead negotiator at the UN climate summit in Warsaw, made a desperate plea to all the countries represented to do something substantial to address climate change, "It's time to stop this madness!" Sano also made a pledge that he would refrain from eating at the conference until "a meaningful outcome is in sight." Obviously monetary donations and general aid are the immediate needs of this struggling country but action on climate change is also considered a priority by the Philippene Government to stop further devastation. The science has given us a picture that has become much more in focus. The IPCC report on climate change and extreme events underscored the risks associated with changes in the patterns as well as frequency of extreme weather events. Science tells us that simply, climate change will mean more intense tropical storms. As the Earth warms up, that would include the oceans. The energy that is stored in the waters off the Philippines will increase the intensity of typhoons and the trend we now see is that more destructive storms will be the new norm. This will have profound implications on many of our communities, especially who struggle against the twin challenges of the development crisis and the climate change crisis. Typhoons such as Yolanda (Haiyan) and its impacts represent a sobering reminder to the international community that we cannot afford to procrastinate on climate action. Warsaw must deliver on enhancing ambition and should muster the political will to address climate change. What my country is going through as a result of this extreme climate event is madness. The climate crisis is madness. We can stop this madness. Right here in Warsaw. "The science has given us a picture that has become much more in focus. The IPCC report on climate change and extreme events underscored the risks associated with changes in the patterns as well as frequency of extreme weather events. Science tells us that simply, climate change will mean more intense tropical storms. As the Earth warms up, that would include the oceans. The energy that is stored in the waters off the Philippines will increase the intensity of typhoons and the trend we now see is that more destructive storms will be the new norm. "This will have profound implications on many of our communities, especially who struggle against the twin challenges of the development crisis and the climate change crisis. Typhoons such as Yolanda (Haiyan) and its impacts represent a sobering reminder to the international community that we cannot afford to procrastinate on climate action. Warsaw must deliver on enhancing ambition and should muster the political will to address climate change. "In Doha, we asked “If not us then who? If not now, then when? If not here, then where?” (borrowed from Philippine student leader Ditto Sarmiento during Martial Law). It may have fell on deaf ears. But here in Warsaw, we may very well ask these same forthright questions. “If not us, then who? If not now, then when? If not here in Warsaw, where? "What my country is going through as a result of this extreme climate event is madness. The climate crisis is madness." Throughout much of Russel's speech he was heckled and interjected by National Party MPs, who strongly objected to the references to climate change. Outside the chamber the National MPs expressed their disgust at what the Green Party leader had said and suggested that he had used the opportunity to make a political statement that was inappropriate. When asked if he believed in the science behind climate change, National MP Jamie-Lee Ross refused to give his opinion on it. I feel the real test of the appropriateness of the speeches would be the reaction of the Philippine people if they had been listening. What would they have thought of Russel's speech and what would Yeb Sano have thought of Jamie-Lee Ross' response? As one of the world's worst emitters of greenhouse gases per capita we should be doing more to cut them back. It is fairly obvious that under a National led Government the sort of support that the Philippines really want won't be forthcoming. Postscript: Russel receives support from Yeb Sano himself for his speech and more National MPs are exposed as Climate Change deniers. I've sent a letter to the editor containing my thoughts about the National Party MPs and their disgraceful outbursts. It will inflame some. Not just semantics, but would you say climate change was measured by science, rather than determined? Interesting thought, Shane, it is probably both. Climate change as a phenomenon is established or determined through scientific research and the extent or progress of it is also measured by science. Robert, sadly there is a small but very vocal group of Monckton supporters and a good number of them use the same reasoning to support the Act and the Conservative Parties, National's closest allies. Both parties are the only ones who deny the existence of anthropogenic climate change in their policies, and their combined 3% of party support almost replicates the percentage of supposed scientist who are also skeptics. The reaction to any letter on this topic is very predictable, do you really want to give them another opportunity to publicly vent? Climate change is a fact. Science allows us at this stage to measure climate change. ManBearPig gives us a good laugh. I welcome their venting. Climate change, especially at this moment, should be a topic of discussion in our homes and workplaces. It won't be that unless someone brings the topic up, repeatedly. I very much admired Russel's action in the House yesterday. He knew he'd be attacked, but believed it necessary to go ahead. Same. There are two views, the first says that we should do no more than we have to to manage our greenhouse gases and protect all polluting businesses as long as possible and the other says our record is abysmal and we must strategically plan for a total transformation towards a low carbon economy. The first will mean that when change becomes inevitable in the future we will be ill-prepared and our economy will struggle to compete, the second will mean that we would be well positioned for the new economy and the benefits that will result. It's a no brainer!